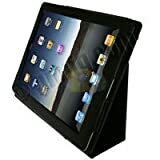 BestPriceCables' iPad 2 / 3 generation polyurethane leather case is stylish and features non-scratch material to keep your iPad 2 protected and looking like new. Magnetic corners secure the case from accidental opening. The case also allows you to flip the flap to the backside to transform the case into a comfortable viewing stand. All features are functional with the case on. Camera and speaker holes have been specially cut out for your convenience. The iPad 2 case will keep your device protected at all times and is great to use anywhere at home or on the go!